How important is grip training? Very important if you ask me. If you can’t hold onto the bar, you can’t perform the lift. If you can’t hold onto a rebound, your coach is going to be yanking you out of the game for turning the ball over. If you can’t hold onto the air conditioner as you’re removing it from your window, it’s going to fall on the poor lady standing 2 floors down (almost happened to me today). I could keep rambling on about instances where grip strength and endurance comes into play. Don’t you get angry knowing that you could have done another 3 or 4 pull ups, but your grip is so weak that you couldn’t finish the set? But is grip training part of your workout routine? Probably not. This weeks exercise is so simple it doesn’t need a video or a picture. At the end of your workout get into a power rack and set the pins up below waist height. Load some weight on the bar (I’d say either 185 or 225). Now, I know the headline says “fat bar”. If you’re able to use one great. If not, get a towel and wrap it and around the bar. Or there is a great product out there called Lynx Performance Grips. Check them out at http://www.lynxpt.com/. I’ve been using them for any pulling movements and boy will you feel the difference in your forearms. Anyways, whatever bar or implement you’re using, reach down grab it and hold on for dear life. When that bar slips out of your hands, rest for 2-3minutes and repeat for one more set. Over time, watch your strength numbers and performance improve. Yeah I know. That’s not a picture of the Fat Bar Hold. 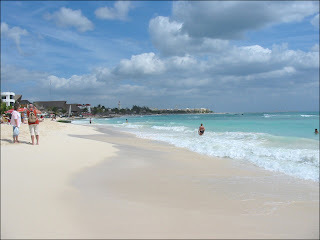 That’s a picture of a beach in Mexico, where I will be next week on an overdue vacation So until I’m done soaking up some rays and having a few Coronas, give some Fat Bar Holds a try. And when I’m back, maybe the next Exercise of the Week will have something to do with sitting on a beach with drink in hand. See ya.